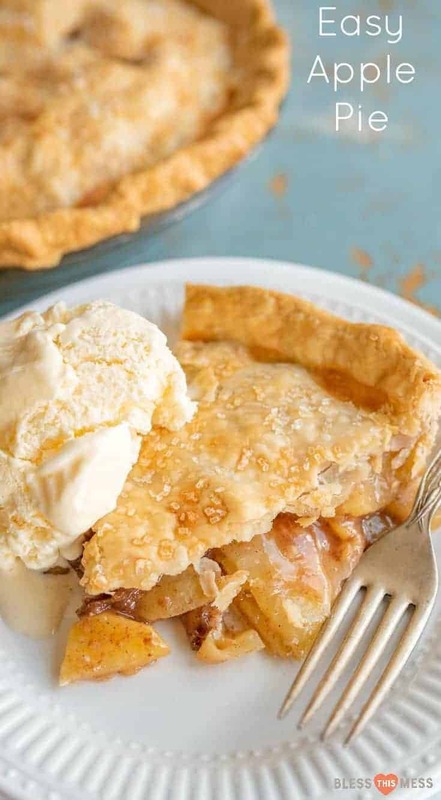 Your go-to basic apple pie recipe using fresh apples in a homemade crust with very little added sugar. A basic apple pie recipe is simple and the end results are just plain tasty. It’s a recipe that everyone should have in their collection. 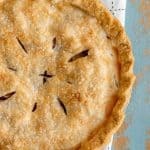 This apple pie doesn’t use a lot of added sugar and you don’t have to cook the apples before adding them to the crust. It has about an inch or inch-and-a-half of sliced apples inside the crust, which I think is a nice amount. I think apple pies that are 3 or 4 inches high and stuffed with apples are gorgeous, but I like a more even crust-to-apple ratio myself. When you don’t have that many apples in the crust, you don’t have to precook the apples because there are a lot less in there to shrink and put out extra liquid. 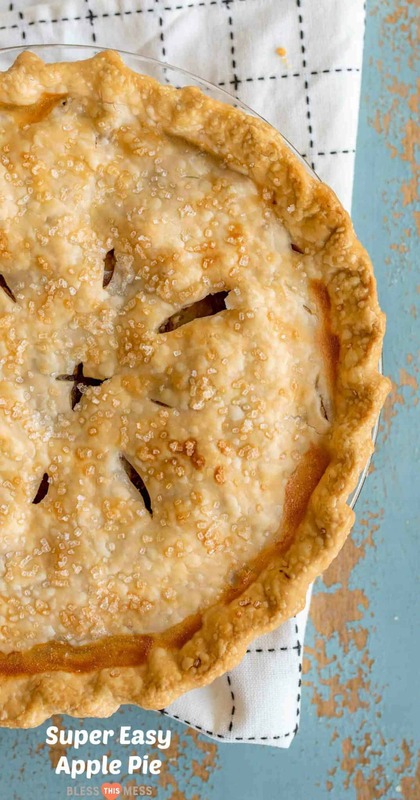 Need a crust recipe to make your apple pie? I got you covered! 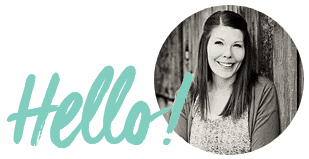 I wrote a huge post all about pie crust! This basic apple pie recipe is a staple in our house and I hope you love it. You can find this recipe plus SEVEN other pie recipes in one post if you are looking around for something that looks perfect for your Thanksgiving table. There’s something magical about pulling a pie made from scratch out of the oven. It seems to take you back to a time when life was simpler and homemade pie was standard fare in American kitchens. Today, amidst the hustle and bustle of everyday life, taking time to make pie is almost therapeutic. It’s a slower process than opening a box of brownie mix, but there’s so much satisfaction in it. Butter, flour, and sugar are the building blocks of all things good, and making a homemade pie is a pretty great way to use them. Plan to take an afternoon to bake and you just might love how grounding the whole process is for you. And you’ll have a beautiful pie to enjoy after dinner or to share with friends, and that’s a pretty great reward, too. Try to find a firm apple to use in this recipe. I like a mix between sweet and sour apples. You can use Granny Smith, Jonathan, Jonagold, Winesap, Golden Delicious, Honey Crisp, Gala, or Rome Beauty. I used a mix between Golden Delicious and some kind of tart firm apples from our trees for this pie, and it was great. It’s very forgiving, so experiment! If you want this pie to slice nicely (and not have some of the fruit ooze out onto the pie plate after you remove a slice), then let it cool to room temperature before serving. Hot apple pie is delicious but the apples will slice and stay inside your pie if you wait. It’s up to you. Sometimes I cut into hot pie and just scoop some of the apples out of the pie plate. 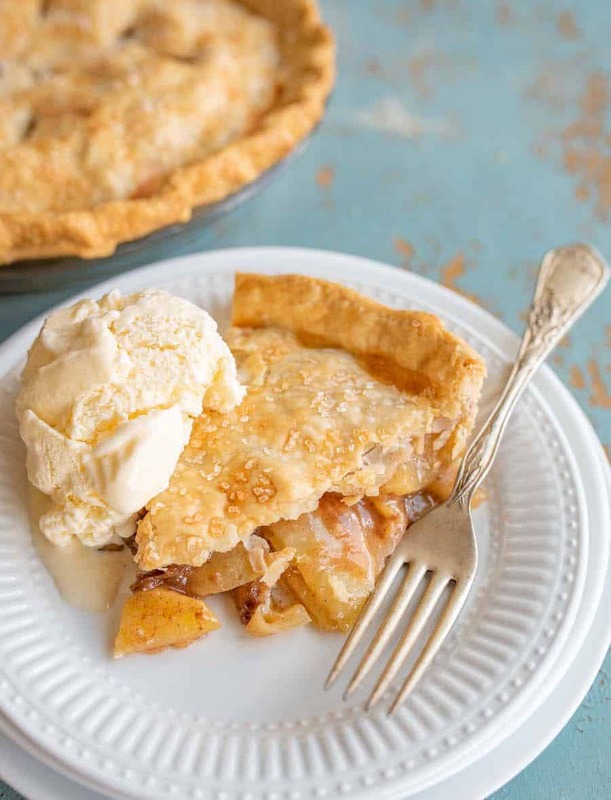 This apple pie recipe is very easy to customize. You can add more sugar, replace the sugar with brown sugar, add a drizzle of caramel sauce to the filling, use apple pie spice, or up the amount of cinnamon and add a little nutmeg and allspice. Taste the filling before it goes into the crust and adjust it to your taste. A regular sized pie plate will work for this recipe, just place the pie on a cookie sheet while baking so that if the filling bubbles over a bit while baking it won’t drip to the bottom of the oven. My go-to apple pie recipe made with fresh apples! Homemade, flaky crust with juicy apple filling. 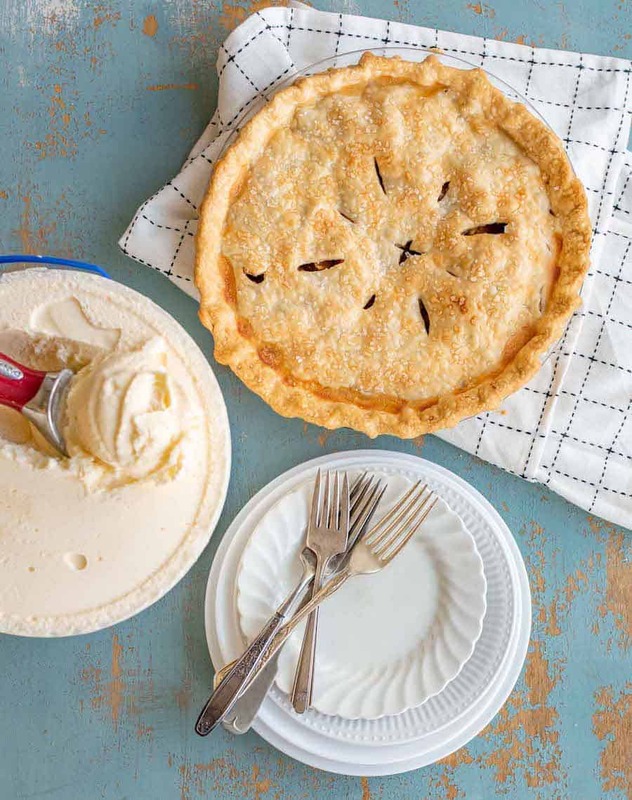 Makes a delicious pie that goes perfectly with ice cream! Top with second pie crust, crimp the edges, and then cut a few slits in the top crust to allow steam to vent. Here’s a post about how to cut apples it you need it. If you peel them first and then cut them this way, it’s the fastest way to get your apples prepped. You’ll want to cut these apples about 1/4 inch thick. Try to find a firm apple to use in this recipe. I like a mix between a sweet and sour apple. You can use Granny Smith, Jonathan, Jonagold, Winesap, Golden Delicious, Honey Crisp, Gala, or Rome Beauty. I used Golden Delicious from our trees for this pie and it was great. In the world of pies, this one has a very low amount of added sugar. If you are using tart apples you might need to double the amount of sugar. Just taste and see. 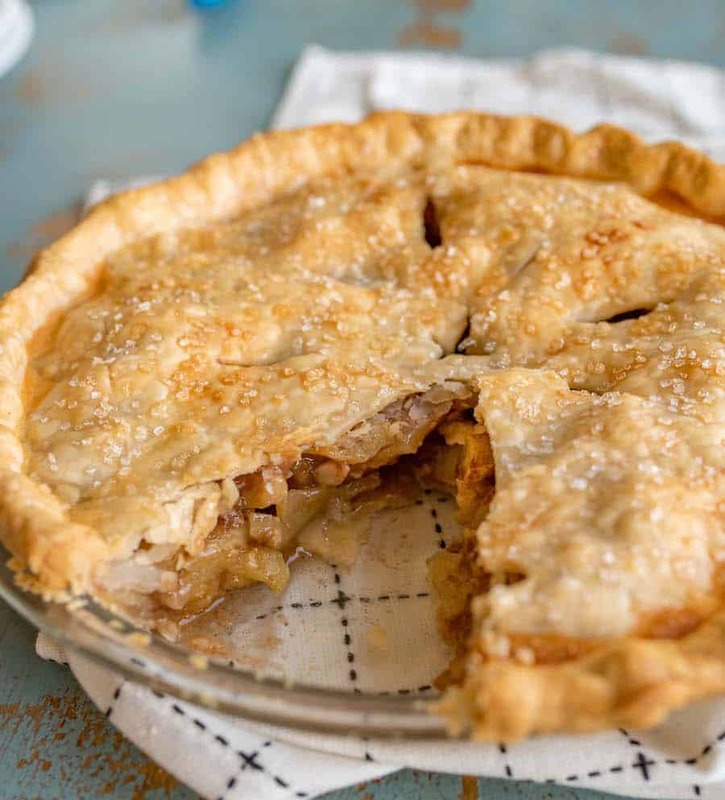 Nothing says welcome home like a fresh pie on the counter, and this apple pie recipe is just the one to try! You are going to love how easy it is to customize and how quickly it comes together. Happy pie making, friends, from my kitchen to yours! at what point do you put in the first 5 ingredients?? you don’t mention it. 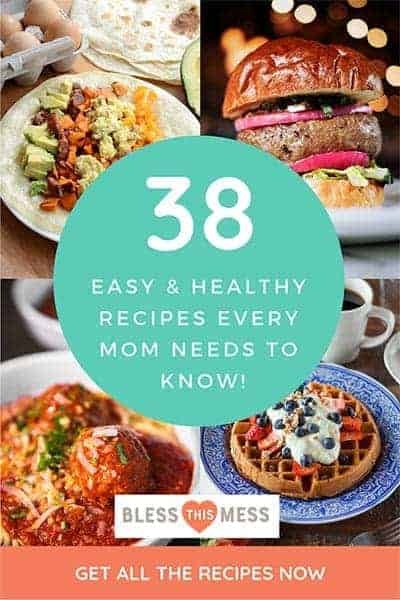 how can I trust a recipe that leaves out important info? It says in #3 of the directions to add the apple mixture to the pie crust… not sure where the confusion lies? It’s a great solid recipe that we make over and over again! It says to mix the first 5 ingredients together and that includes the spices and the apples! YES oh my gosh, sorry! It sure does! I’m used to mixing the spices and sugar, THEN adding that to the apples. Anyway this pie was delicious and I’m making another one tonight! Only three tablespoons of sugar? And it’ll be sweet enough? Plan to bake this weekend. Yep! You might want to double it if you are using all sour apples but if you are using a pretty normal firm sweet apple, it’s perfect! it says right in the recipe. after putting in the bottom crust add the APPLE MIXTURE. This looks great and will hopefully be making tonight! I’m a first time pie maker and I wonder as a rule of thumb do you cook the bottom of your pie crusts first? like 10-15 mins? 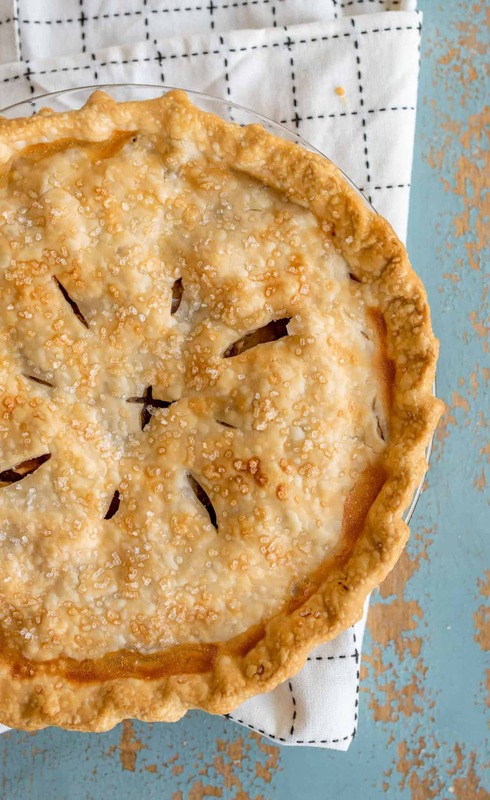 Nope, no need to prebake this pie crust, it’ll cook through just perfectly all at once! I can’t wait to hear how it goes! Thank you so much Jackie! It’s on my menu for Thanksgiving too! I’m so glad you liked it enough to share, that means a whole lot to me. What kind of foil would you reccomend using for step 7? Any kind of food-grade foil you get near the other plastic baggies and parchment paper should work great. Thank you for letting me know. I just got a new web design last week and we are still working on ad layout and placement, I’ll let my team know. I don’t want things to be hard to read for sure! Also, do you know what browser you were using and what device? It’s a lot easy to find things that are wrong when I know those two things. THANK YOU! Woohoo! So glad that it turned out well and that you all love it!